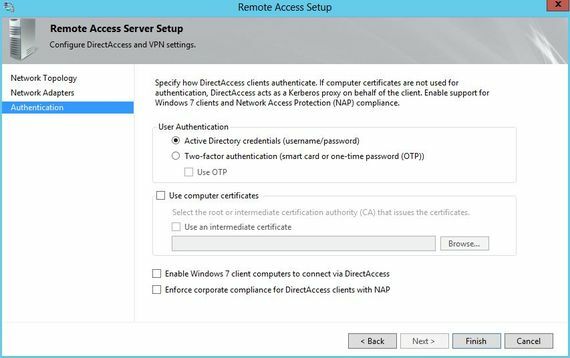 In part 1 of this series, we configured DirectAccess for IP-HTTPS connection in a simple (home) environment: One public IPv4 environment, a poor router (ISP box), One internal Lan and a Remote Access that runs Windows Server 2012 core. Everything works fine and my client computer can join my internal network from the Internet through a DirectAccess tunnel with IP-HTTPS protocol. We can now start with more advanced concepts. In this part, I propose to get reports on DirectAccess connection and to improve the IP-HTTPS connection times. 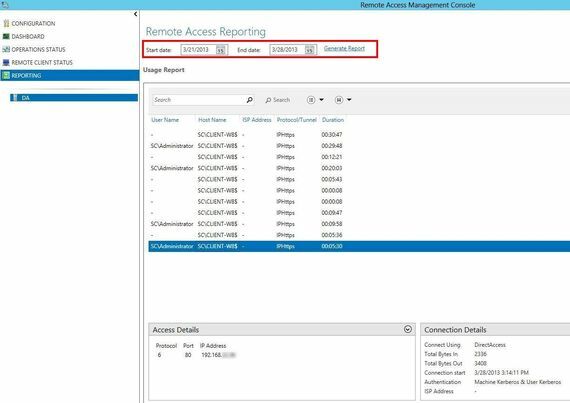 You only have to define the reporting period and click on Generate Report to get information about previous connections. 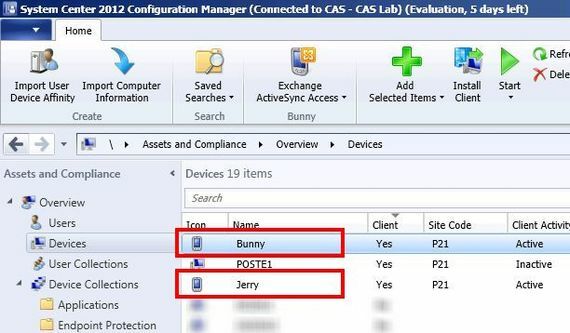 In next parts, I will show you some use cases especially with client authentication. Unfortunatly, 6to4 doesn't support NAT and Teredo requires 2 consecutive public IP addresses. The only available protocol in our case is IP-HTTPS. 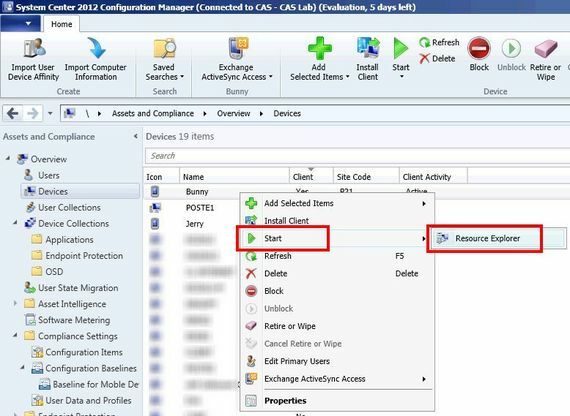 In order to reduce connection time, you can disable other protocols on the client computers. On my own experience, without that improvement, it takes up to 1'30" to be connected. After that improvement, It takes only 40". I hope you enjoy that easy and short part. Keep your energy, in the next parts, we will discuss on authentication with certificates and PKI ! 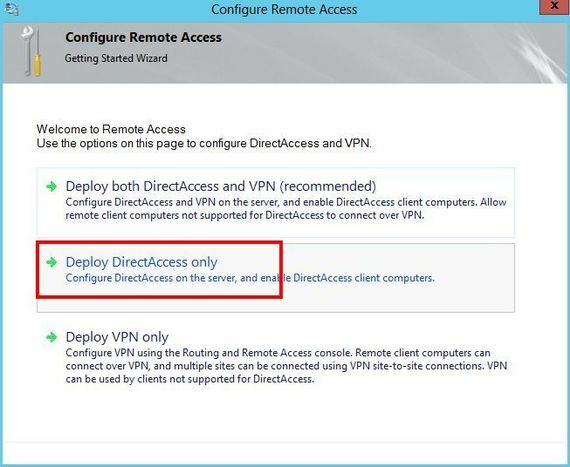 You probably know that DirectAccess is now more easier to install with Windows Server 2012 and Windows 8. In this series, I propose to play with a real case : How to implement DirectAccess at home behind a common Web access. 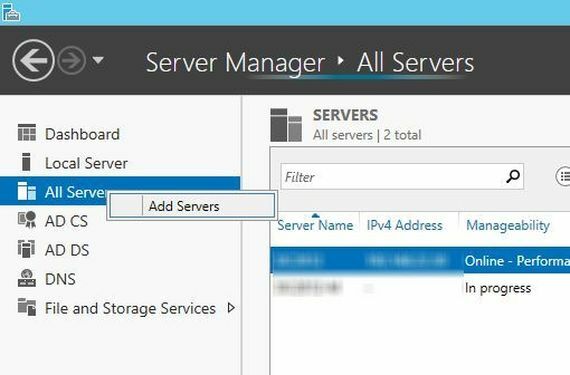 I've got only 1 public IPv4 address, a poor router (ISP box), one internal Lan... but a Windows Server 2012 Infrastructure !! 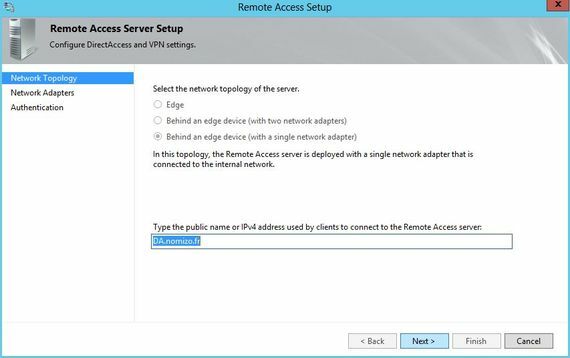 In this first part, the goal is only to be able to access my datacenter (Ok... my VMs) from my laptop connected to the Internet through my mobile phone. 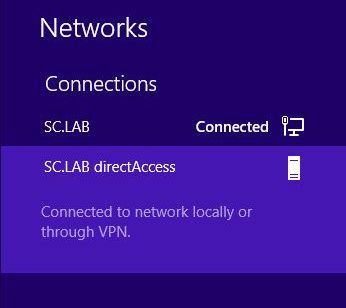 At home, I've got a common Internet access with only one public IPv4, one LAN and my remote access server has only one ethernet card. We will use IP-HTTPS to implement our DirectAccess tunnel. Only one question: Why a Core edition ? Saying experts, "installing a core server reduces dramatically the attack surface and could reduce up to 70% the updates to install." I think it's an important point. 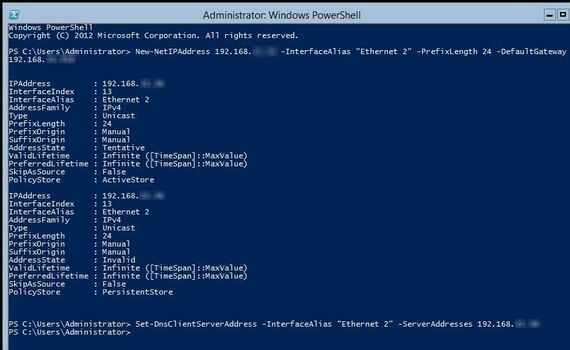 Moreover, everything on Windows Server can be made with powershell or remotely. That's certainly the right time to test ! 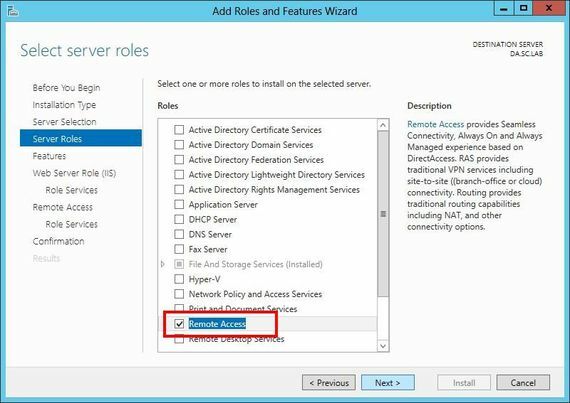 Install normally Windows Server 2012 core Edition, choose a password and logon. Just one question: Have you ever configured a server so quickly ? 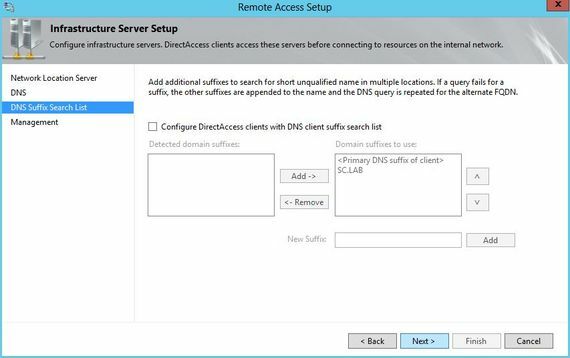 Add on your public DNS a record to your public IP address. For exemple on my DNS, I created the A record da.nomizo.fr to my public IP address. 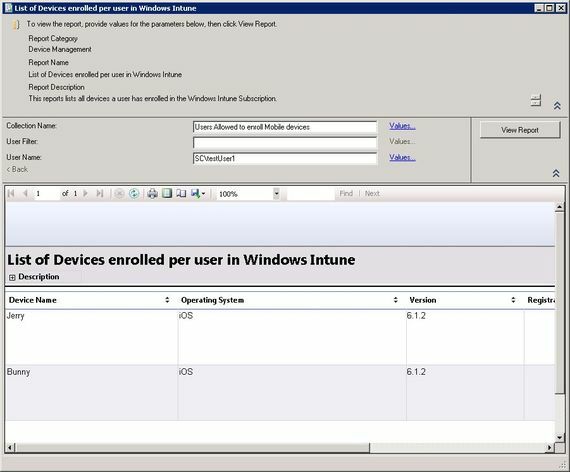 Some people say that you need to forward also the 62000/TCP port (http://social.technet.microsoft.com/Forums/en-US/winserver8setup/thread/d5c3a587-850e-4321-bd62-6a1ef038b72f). That's wrong ! 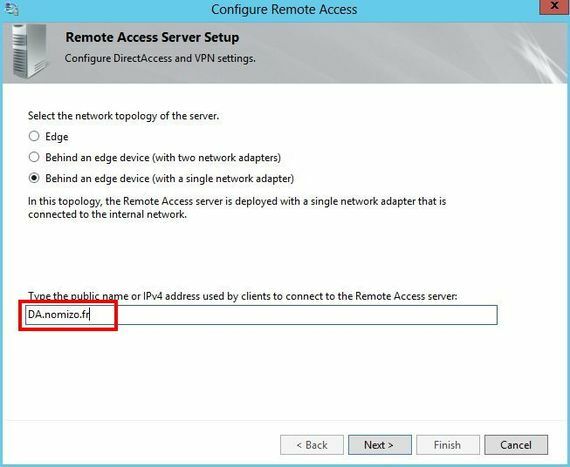 If you are deploying Remote Access with a single network adapter, and installing the network location server on the Remote Access server, TCP port 62000 should also be exempted. 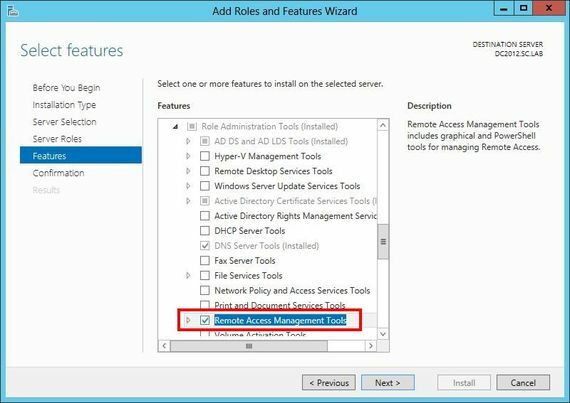 Note: This exemption is on the Remote Access server, while all other exemptions are on the edge firewall. Ok, that's not really clear ! 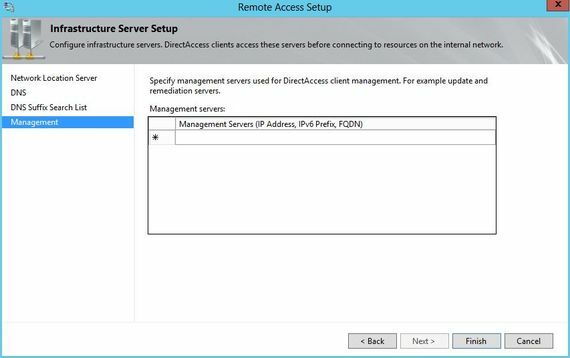 That means that if you have a firewall between your Remote Access server and your internal network (for example if the server is in DMZ), you have to allow your clients (on the internal network) to join your DirectAccess server on port 62000/TCP. 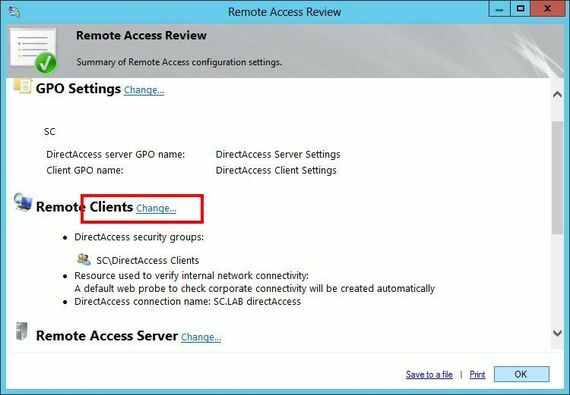 Look at DirectAccess Server GPO. 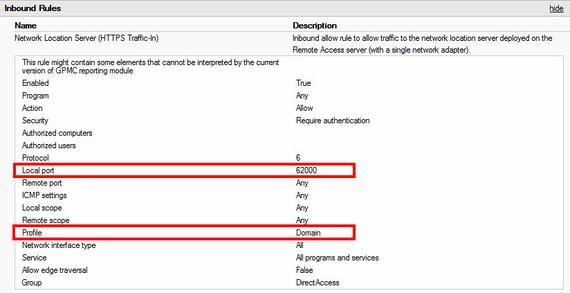 Inbound rule for port 62000 is a domain profile rule, not a public one ! 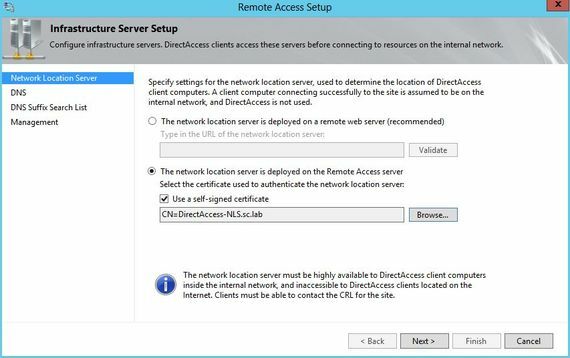 The goal is now to install Direct Access as basically as possible. In the next parts, we will improve the configuration. 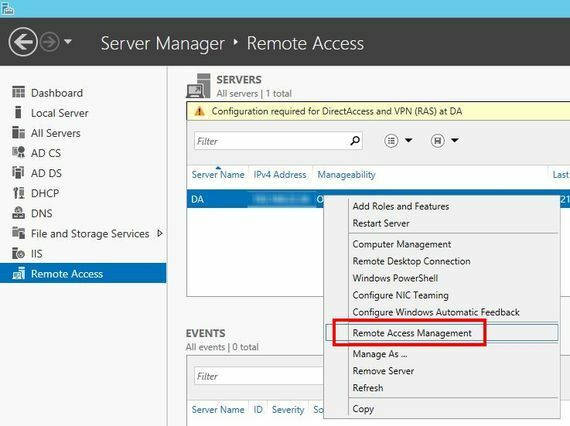 Note: On a Windows Server 2012, if you don't see Remote Access Management, you need to install the corresponding Administration Tools : Simply add the Remote Access Management Tools feature on the server you are connected on. 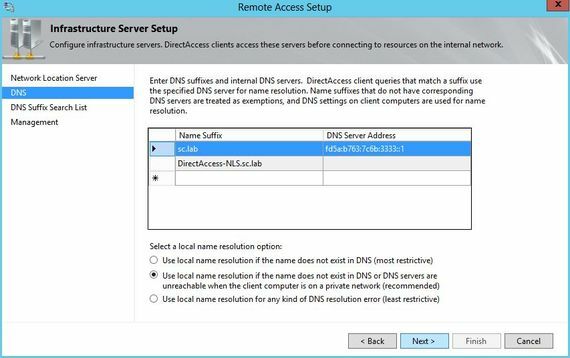 Provide the public DNS name of your remote access server (the name you provided in the 2nd step in your public DNS). You can also provide your public IP address. You can click directly on finish. However, I recommend to modify certain settings. 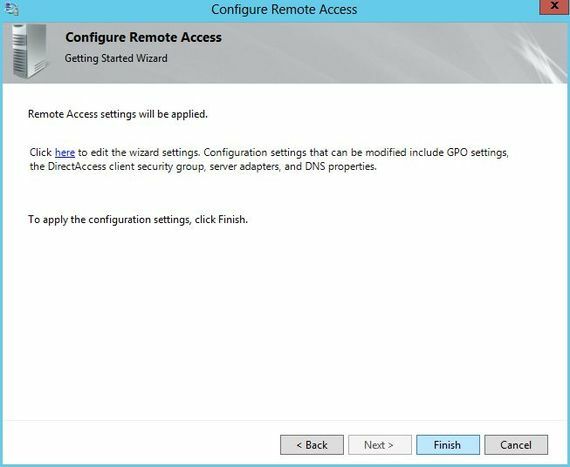 Settings will be published on servers and clients with two GPO. 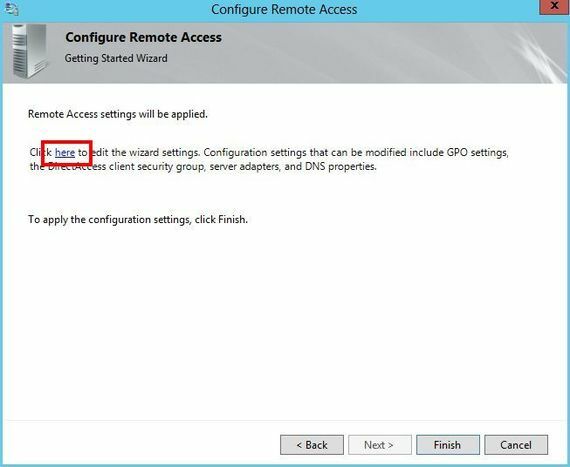 I recommend to limit the scope of the clients GPO with a dedicated security group. 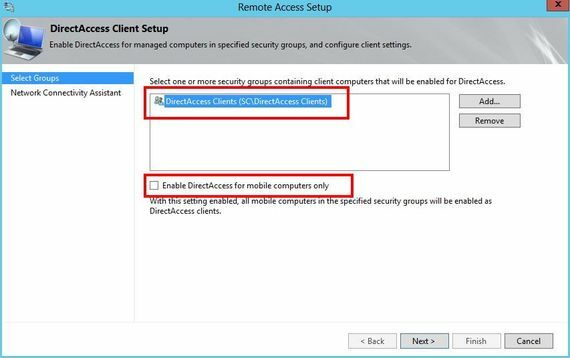 Create and Provide a security group that will contains the DirectAccess clients. 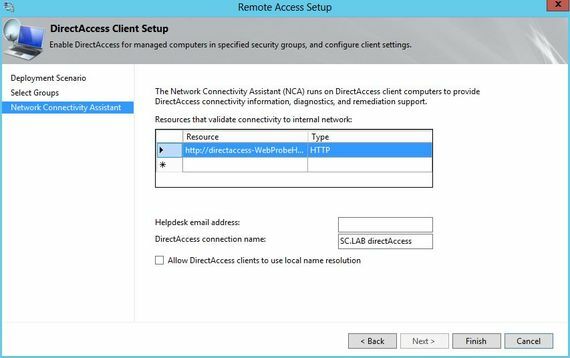 DirectAccess is now configured on servers and clients sides. 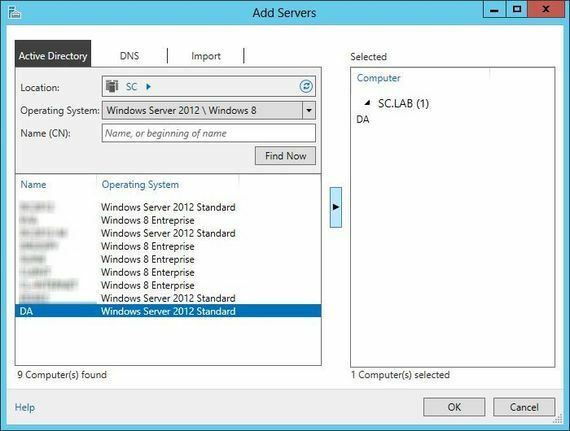 Note: if you have WSUS or SCCM servers, they will be automatically added in the previous panel. 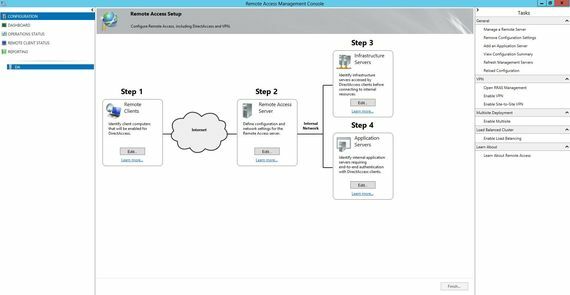 In a lab, you can remove them if they are not always turn on and if you want to prevent alerts in the DirectAccess Dashboard. 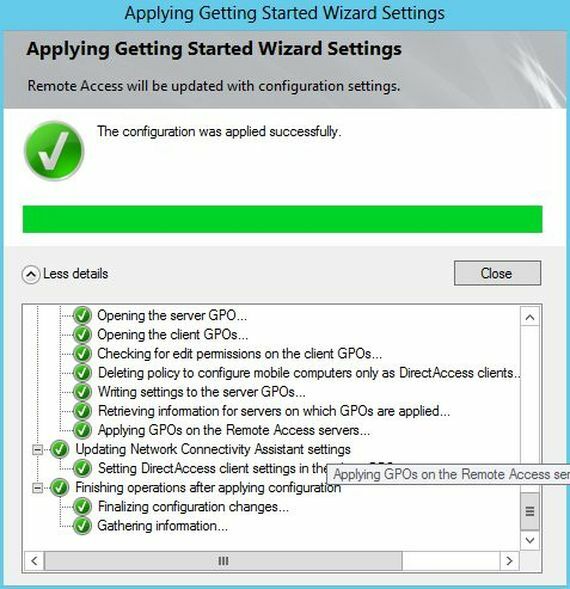 Connect your test computer to your internal network and force policy refresh (gpupdate /force). 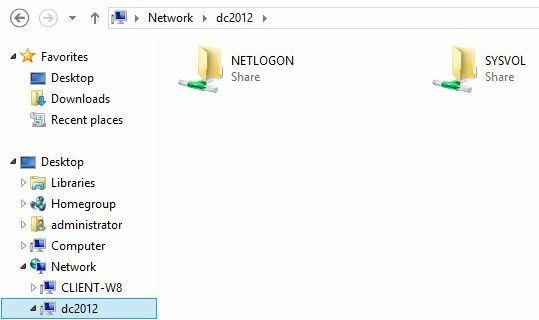 In the network panel, you should see a new connection with a specific icon. 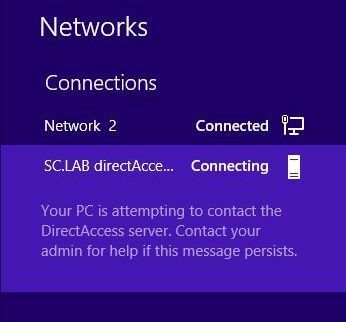 DirectAccess is not enabled because you're already connected to your internal network. 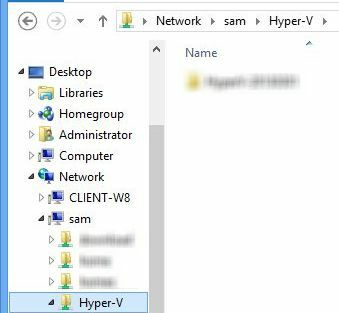 Connect your test computer on an external network. 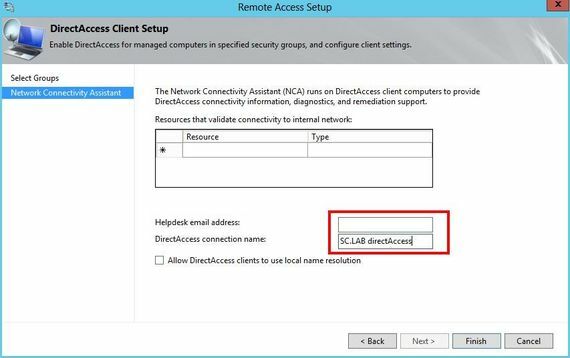 The directAccess client detects that you are not on the internal network and tries to contact the directAccess server. For your information, here is the network configuration of my test computer. 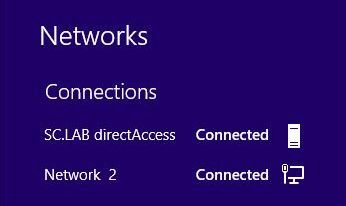 After few time (it can take up to 2 minutes, we will improve that in the 2nd part), my directAccess connection is connected. 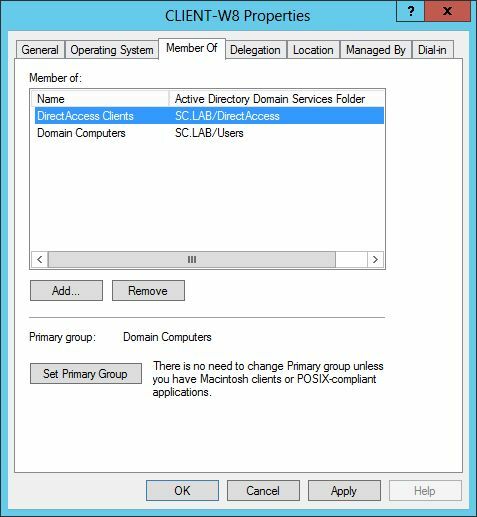 If I try to ping my domain controller. 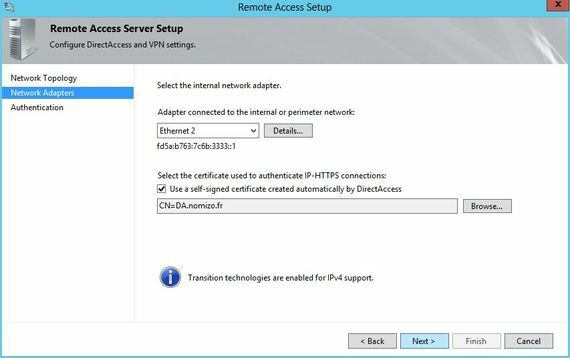 I see that my domain controller use an IPv6 address, even if I never configured IPv6 on that server. 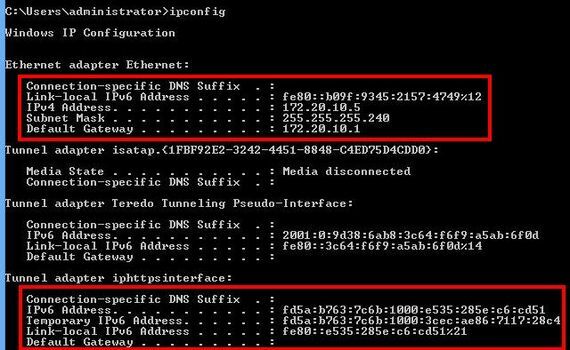 In the 3rd part of this series, dedicated to troubleshooting, I will provide you more information about that IPv6 address. 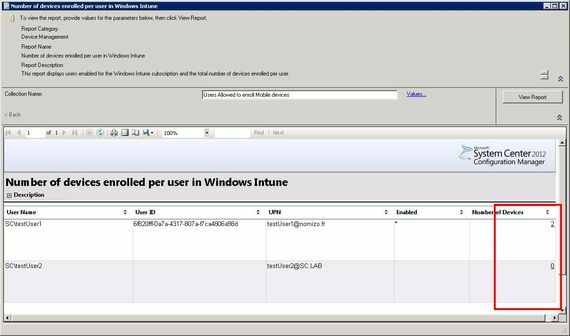 You don't have to configure or to support IPv6 in your internal lab. 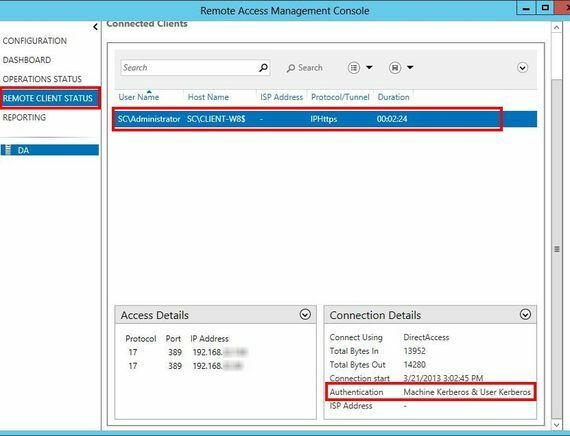 In the Remote Access Management Console, in the Remote Client Status, you get all the information about the clients currently connected. In that case, my client is connected with IP-HTTPS protocol. 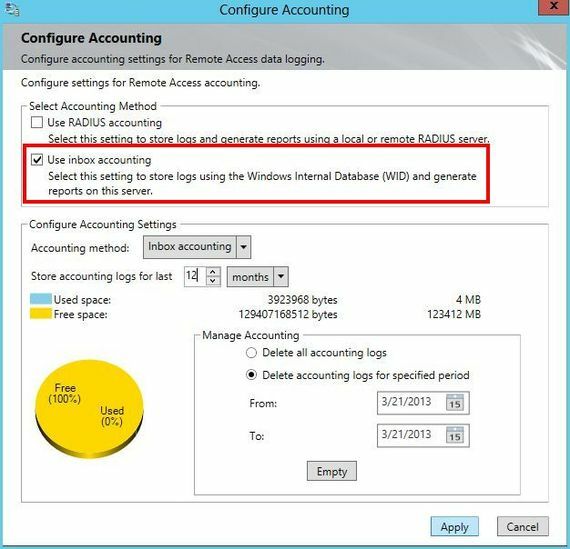 Users and Computers are authenticated with Kerberos. 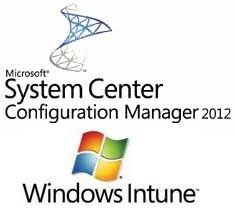 In the next parts, I will show you how we can improve that configuration. 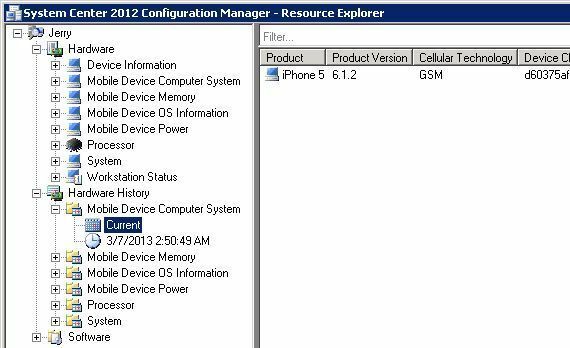 This article is the 5th of a series concerning Mobile Management with SCCM 2012 SP1 and Windows Intune. 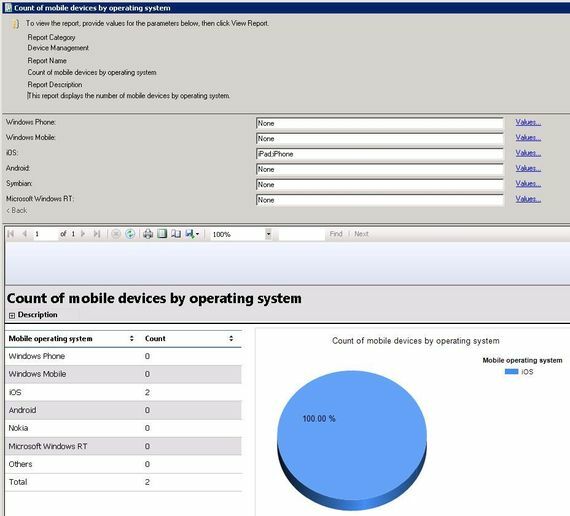 In the last article of this series, we are going to see how to get information and reports on mobile devices in SCCM 2012 SP1. 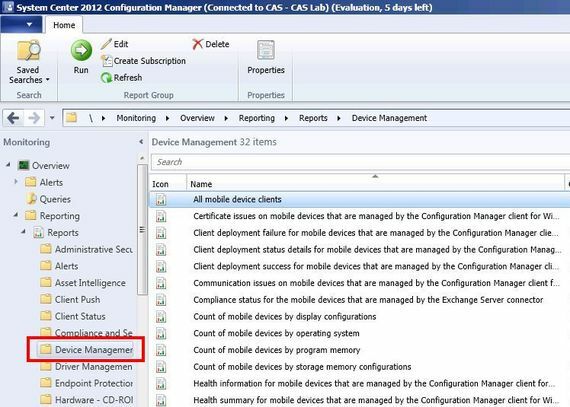 For configuration compliance, read the part 4 of this series: Managing Mobile device configuration with SCCM 2012 SP1. First of all, you can notice that mobile devices have a special icon. 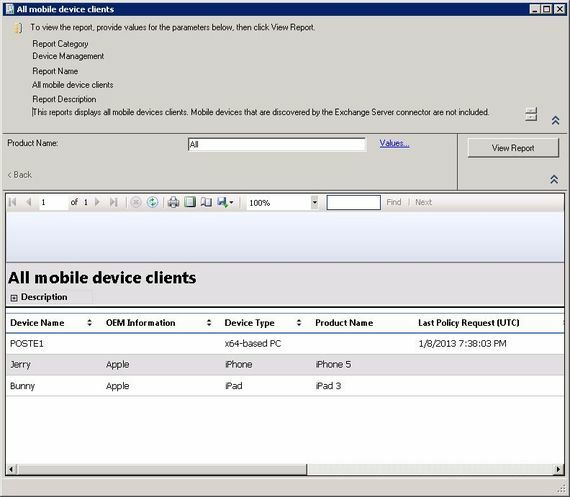 As usual, you can get information in the properties window of the device. Click right on the mobile device. Note that you've got here all feature to block or wipe your device. Feel free to contact me if you look for information.